Our first review of the 2013 year was Song School Spanish. Levi LOVED this program. We slacked off of it a bit after our review because we needed to work harder on his reading. But he asked a while back if we could start it back up again, so we did. With him being able to read better now, it is going really well. I was surprised at just how much he remembered from the original lessons. It’s a GREAT program and I STILL highly recommend it. Next one of MY favorites is Handwriting Without Tears. 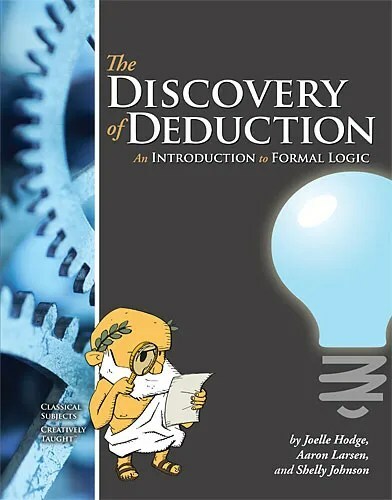 Taylor and I are still working our way through Classical Academic Press’s Discovery of Deduction: an Introduction to Formal Logic. We have worked through it at a leisurely pace, doing chunks at a time together. It has been an awesome followup to CAP’s informal logic, The Art of Argument that we reviewed last year. I have reviewed other formal logic programs, and part of the lack of success was that my oldest student just wasn’t at all captivated by the subject, and the other part might have just been timing. Whatever the reason, however, Taylor has really clicked with the classical subjects and we have had a blast going through these together. I do love subjects that I can learn right along with the student. I think this will really be a significant experience in Taylor’s educational resume for her future. Her brain seems to be wired for logic and argumentation, and Classical Academic Press is one of our very favorite homeschool companies!! One of the most unique and interesting reviews we did this year was Leadership Garden Legacy. At first I wasn’t sure I liked it too much. Not really sure why- I think it just seemed really overbearing in the “anti-bully”theme, and seemed to be full of psychological babble. Like an intense therapy session, sort of. Either way, we ended up really loving this program. I love how the components go together, and how the story ties it all together. It’s a great little family study in my opinion and I guess I should go back and read my review again, and make sure it reflects that! It is funny how our opinions can change as we work through stuff! See the Light’s Paper Jungle was among our top favorites. What a super-great way to get some hands-on art projects in, while learning about real elements of art! And all from a professional artist, that adds in Biblical content and character training! A Mommy-favorite is next: Math Mammoth. While Levi wouldn’t jump up and down for joy and say that Math Mammoth is his favorite, he does work through it very well. The worksheets are easy for him to do and understand, and so very easy for me to print off. I love that I can take a few worksheets and teach him the concepts with the followup problems, and they are organized in a few different ways so he can get some good practice. I love that they are easy enough to give him the confidence he needs to move on, and thorough enough that he is progressing really well. I love that I can print out what I need, when I need it. Math Mammoth is a GREAT math program. Birdcage Press Wild Cards are still being played with. 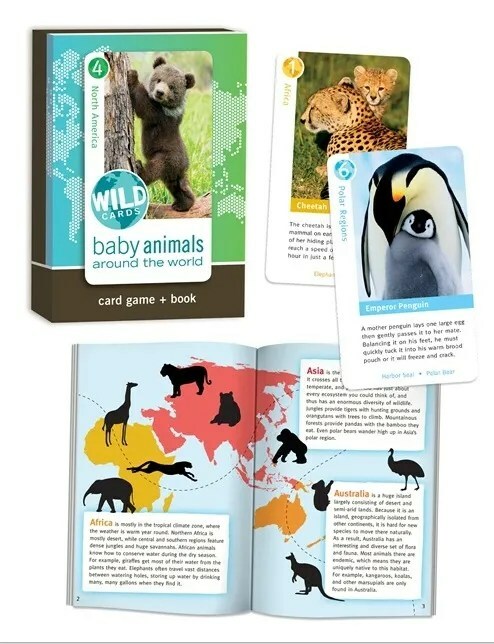 We reviewed the Baby Animals Around the World which came with a neat little book. I’m glad I came across this review again because I remember something I wanted to put on my Christmas shopping list. I think a couple of these sets will be great stocking stuffers! Levi voted for these as his favorites in a couple of the Crew voting categories. A favorites list just would NOT be complete with Institute for Excellence in Writing on it. While we continue to use many of their other products, I was blessed to review one that I have always been interested in this year. It was really a review for ME, as I was to use the program to learn how to teach the classics to my students. Teaching the Classics is certainly the quality and excellence I’ve come to expect from IEW. The program is thorough, very well laid out in structure, organization, explanations, and of course the seminar format is just my favorite. I have grown to love the classical approach to teaching and we had started with teaching classical literature a few years back. With Levi, my newest student, it’s been nice to adopt a bit of a new approach to keep myself interested and learning as well. IEW’s PAL reading program that we started last year that ended up being an absolute life saver for us begins the classics and basic format of teaching in this way very early. I LOVE the way that the IEW products, though from different authors, all mesh together. I just LOVE IT! 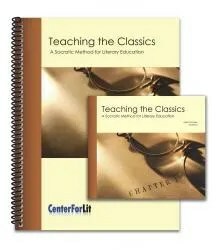 I have adopted some of the teaching from Teaching the Classics, but as we are still working our way through really getting our reading and spelling down good, I haven’t really dove into the nitty gritty of the program yet. 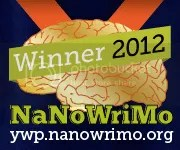 I am anxious to go back through the program and add to my notes and really get going on it. The program is super-motivating and encouraging and really lights a fire for teaching! I highly recommend this one, and will say it was probably my favorite teaching program I reviewed this year! 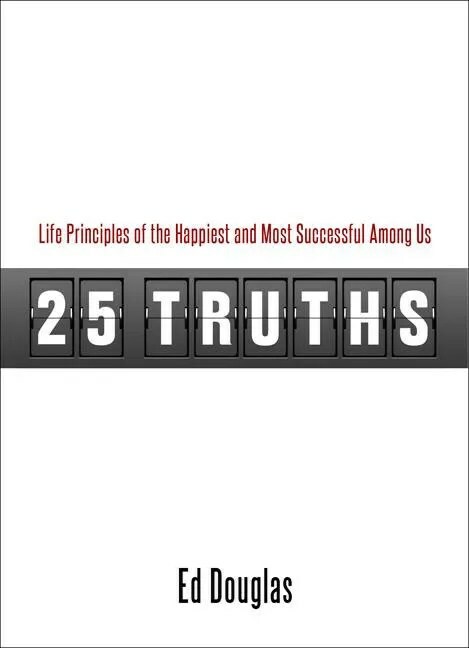 Next on my chronological favorites list from the 2013 Crew year is 25 Truths. This is just a super-cool little book for EVERYONE. I really love the charming story of how this book stemmed from a list of truths a coach gave to his team to live by. It’s just really the way we all should live! This would make a FABULOUS gift for graduates. What a fun, nostalgic, exciting fulfilling, wonderful experience!! I feel a little off that I didn’t make an actual “yearbook”, but what I did make was a memoir of one of our biggest, best and most significant homeschool projects and accomplishments of all time. I put together a memory book of the journey we took in breeding and foaling our own baby horse. It was a magical time, and the memory book really shows that. The rich colors, backgrounds, quality paper, layout, they are all just perfect. I LOVE these books. I will be making more! 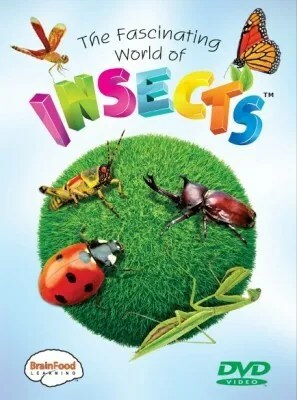 Another Levi-favorite is the Fascinating World of Insects dvd by Brainfood. This really is a wonderfully produced and put-together dvd. The photography and video are amazing, up-close and definitely capture the attention and affections of my 7 year old. I really LOVE the way the video has questions and quizzes included! This got a Levi vote in one of the Crew Favorite categories too! 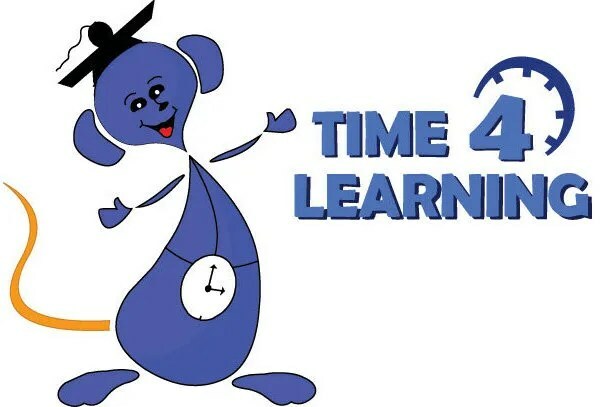 Time 4 Learning has been another life-saver for us. Definitely a favorite, because it’s easy, educational, and has led Levi to some amazing progress in his reading and learning this year. I love it because of the content- it’s introducing him to some basic things (okay, yes, it’s public schoolish, but it’s good basic info!) that he is grasping and interested in. I love Time 4 Learning also because Levi can use it fairly independently, and I can count on him learning while I’m not able to be here to teach him, yet I can see the progress he has made. I am planning to continue his subscription monthly once it’s over. It’s a great tool, and peace of mind for this season of our homeschooling! We were blessed to review an old favorite that has been rekindled as a NEW favorite! God’s World News is a monthly current events newsletter with a Biblical perspective that I subscribed the girls to for a few year. The newpapers are on the child’s level: Pre-K-K, 1-2 grade, 3-4 grade, 5-6 grade, middle school and high school. They also have an adult magazine called World that I just LOVE. Before I was able to subscribe to each girls’ level and the content was the same so we could discuss the material together. I really loved that about the magazines, but our favorite part was probably the big wall map that the girls got to stick flags to as they did their “map-it” activities. These are little boxes included in some of the articles to map the location of the current event. Well, just as I suspected, Levi has been every bit as excited and interested as his sisters. I just LOVE sitting down with a fresh new newspaper for us to explore. It’s just a wonderful addition to our school day and is motivating, and filled with fun puzzles and projects as well. There is a neat online website now too that has wonderful Worldview news and is linked to the magazines and can be accessed at all levels. I have thoroughly enjoyed getting to read through World magazine again myself as well. This is a Gunn Ranch Academy Favorite for sure!! Rolling around to fall of this year, Taylor’s favorite and voted our family favorite is next up. Taylor was blessed with the experience of reviewing and online Marine Biology course from Bridgeway Academy. She was super excited that the subject was Marine Biology because that is her career of choice as it stands and has been since she can remember. 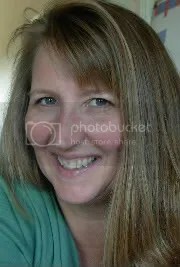 She has been through numerous marine biology courses in the past, and studied Apologia’s Swimming Creatures for three years in a row. LOL. She has studied and made numerous notebooks on her own, and was so excited to be able to be taught by a real marine biologist teacher. She enjoyed the online live lectures so much once we got our new internet and she was able to participate. She couldn’t make her homework submit correctly through the online website, but was able to email the instructor. Taylor did a phenomenal job and worked so very hard on her projects that it seemed like she should be getting a college credit for what she was doing! She said upon wrapping up her course that she would really love to do more courses through Bridgeway academy like this. She LOVED it. Realistically, I don’t think it will be in our budget, but I am going to keep an open mind! Bridgeway Academy was voted Taylor’s favorite, and our family’s favorite. Our next to last review of the year was a series of 4 little paper back books that covered different cultures around the world. The packages came with some extras besides the paperback books. We got a blow-up globe, two flag pencils, and two different paper passports. These little books are jewels. Levi and I both call them favorites. The way they are written is really cool and I can’t wait for more to come out. We journeyed through 4 cultures, learning history, language, favorite food, names, cultural events, and more. We looked up many of the places, events, and other things on the computers and planned a trip someday to the Snow Hotel in Norway. These are really fun little books and a wonderful way to bring geography, culture, and some unit studies into your day! Last but not least, a mom favorite that I enjoyed reading so very much. I was able to sit back and relax and get a little nostalgic as I read through At Home in Dogwood Mudhole. 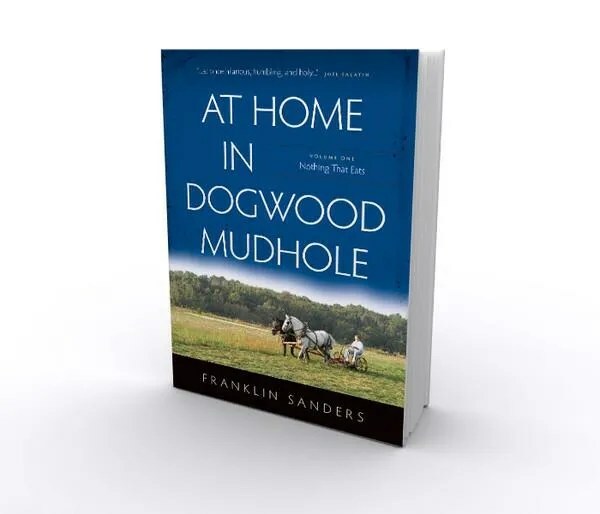 I just loved the journey through the real life times of the Sanders family in Dogwood Mudhole, Tennessee. I am not really much of a “book reader”, in the fact that I just don’t have or take the time to really sit down and read a book cover to cover. I tend to spend my time reading instructional stuff, digging into vet cases, animal stuff, etc. But this book was something I just couldn’t put down. 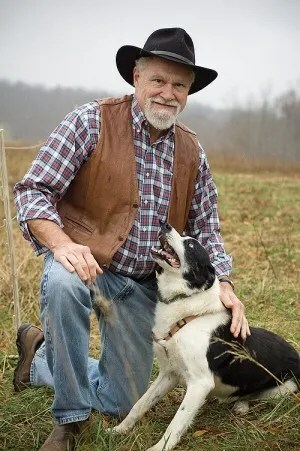 It wasn’t like any other I had really read, and I guess I loved it so much because of my connection to Tennessee and farming. and animals, and kids and family. That’s what this book was all about, and it is one of my favorites! Gunn Ranch Academy’s 2013 Crew Favorites! Well, another TOS Crew Review year is finishing up. I just posted my last review, which is number 28 for the 2013 year. This has been another interesting and busy cruise full of lots of hard work and abundant blessings. I have worked diligently to blog about other things this year and was successful at getting my 4 posts other than reviews in. I try really hard to keep our 4-H activities updated because that is a HUGE and meaningful part of our lives and our homeschool lifestyle. For the upcoming year we will be required to blog once weekly, so that will be another challenge to face if I am accepted to the crew again. We discussed together whether our family should continue on with the crew and I prayed a lot about it. I weighed the pros and cons just as I have in past years, and find that things really do change a lot as the years progress, both with the crew and with our homeschool and with my own time and energy. As with everything, the crew has changed, matured, grown and more/different requirements and expectations have come about. I have been able to meet those changing rules time has progressed, and I am still within the guidelines this year. The biggest obstacle for me is time, as I have way too many irons in the fire. I do work outside the home, and have to really work to keep our schoolwork moving in the right direction. The only real way it can happen is that my older two girls have become wonderfully independent and have that fire burning within to learn and succeed. It’s a bit harder with my 7 year old, but we are making progress as well. I do have to pass on the blogging extras like linking up on certain themed blog cruises, blog carnivals, blog giveaways, etc. I know that cuts my traffic down for “regulars”. This year there was some concern on the part of one or more of the vendors about the exposure/traffic on our blogs. They were concerned that some of our blogs only had a few “followers”, as well as the concern that not very many of the posts/reviews had comments. This kinda really stressed me out because my blog doesn’t have tons of followers because I don’t have hours and hours to sit at the computer. I don’t spend tons of hours with giveaways, facebook promotions, social media. I just don’t have the time to devote to sitting at the computer like that. I’m not putting anyone down who does- I’m actually pretty jealous of those stay-at-home-moms who do have the chance to stay at home and take care of “home” stuff. But I am not one of them. My life runs 1000 miles per hour all the time. So the comments really ruffled me up a bit. But mostly because the “followers” are not really the ones who are interested in “yet another” review. They are really not the ones “buying” all of these things we review. And when people click through the TOS review crew blog to check out multiple reviews on something, it’s rare that they would leave a comment on it. I NEVER really leave comments. I just don’t. Especially when I am reading through reviews for information on something I’m looking to buy. I get lots of emails and “outside” comments from my reviews if someone is really interested in something. I give LOTS of recommendations for the products we love, both when asked, and when NOT asked. I take my job as a reviewer VERY seriously, and it kinda just really still ruffles my feathers that a vendor would think otherwise. I consider QUALITY to be more important than QUANTITY. So that WAS a consideration as it has been EVERY YEAR I have been on the crew- whether or not I am doing a GOOD job, or even a GREAT job for these vendors. My work ethic has always been to do the VERY best job I can at whatever I am doing. In the end, I feel my reviews are golden to the vendors I represent, and even more valuable to my homeschool community. I have helped a LOT of folks find just the right product, as well as helping some not waste money on something that might not work for their family. I have met so many amazing and awesome vendors that have been and are STILL on my prayer list, because I really do appreciate. more than I can express, when people use their gifts and talents to bless others. With my older girls moving on into more time consuming and more challenging schedules and studies, it’s been harder to include them in reviewing. The crew does review high school and upper level products, and we have had to pass on many because my high schooler and even jr high student just cannot fit full course studies into their already full schedules most of the time. But there have been times that we have worked some very valuable programs and products in with them. My Jr. High student is super-great about working with my 2nd grader, which is also a wonderful aspect of review for the crew. It’s a whole different perspective that our family brings to the table. Just one among many. In the end, I feel our family does a wonderful job and brings a unique and honest perspective to the crew, vendors, and homeschooling community. My kids all voted to stay, and so I reapplied. If it’s time to move on, we will certainly understand, but if not, then we will see y’all to set sail again in 2014. For now we are back on land, and ready to enjoy the holidays. Stay tuned for “Our favorites” post along with the crew favorites that we voted on! Categories: On the Homefront, TOS Crew Reviews 2013 | Permalink. Some like Franklin Sanders have been blessed with the ability to tell their awesome journey with a purpose. That’s what At Home in Dogwood Mudhole is all about. This three volume collection of personal letters that Franklin Sanders wrote to his “dear readers” of The Moneychanger newsletter is a unique, funny, and very real look into 16 years of the life journey of the Sanders family. He wrote the letters not as a “memoir to look back on events and impose some kind of meaning after the fact”, but as a “recounting of family news”. He let life itself add the experience, wisdom and faith. For review, I received a softcover copy of At Home in Dogwood Mudhole Volume One: Nothing That Eats. $22.95 The 379 pages cover from June 1995 to September 2002 chronicling their move from city life to farmlife in Dogwood Mudhole, Tennessee. Volume Two: Best Thing We Ever Did is also now available with Volume Three to follow. Meet the Sanders family: Franklin and Susan, and their seven children Liberty, Justin, Worth, Wright, Christian, Mercy, and Zachariah. Along the way we also meet in-laws, grandchildren, grandparents, lots of friends both old and new, and many, many family dogs, and other pets/farm residents/livestock and such (especially chickens, lol). The book being a compilation of chronological writings for his newsletter gives it a delightful, conversational feel of everyday happenings, emotions, thoughts and dreams, births, deaths, broken arms, struggles and celebrations, much like reading a personal journal or blog. We become familiar with the family’s love of history, specifically the Civil War, which Mr. Franklin prefers to call the War for Southern Independence. We journey with them as they participate in reenactments, cemetery walk-throughs, visits to battlegrounds, and the Confederate ball. In addition to their rich love for history, they are living in a time when the mystery and unknown of Y2K was a challenge to prepare for. They share their preparations, thoughts and decisions with their readers as they move closer to the turn of the century. Dogs and chickens is a common theme running throughout, as well as gardening and farm-life in general. As the family converts from city-life to country-life, they share the whole spectrum of adventures from tragedy to the sweet joy of connecting with their own little piece of God’s world. We read about Mr. Franklin’s gold and silver business, and his standing up for his constitutional rights, landing him in jail. The geography and southern charm of Middle Tennessee and the surrounding areas are described to a “t”, down to the addresses of the most amazing places to eat, sleep and visit. Relationships with friends, in-laws, and acquaintances leave you feeling a sense of warmth, and sometimes laughing out loud. This book is about family, love, and life. Throughout the pages are scriptures intertwined into the adventures. Life lessons. Real life lessons captioned by scripture, prose and poetry. 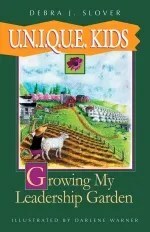 From learning to raise and doctor their animals, to growing gardens, to building and constructing new inventions, to working the land that God gave them while relishing in the growth of new life-both human and non-human, At Home in Dogwood Mudhole captures the very essence and charm of appreciating all God has given us. Throughout the pages are also pictures of the family, giving us an even more personal journey as if we are a part of their family. Wow, where to start. I guess I will begin by saying I can relate to this family’s journey both in their move to country life and to the place they call home. My immediate family all transplanted to Middle Tennessee, with me following after my graduation from veterinary school. My goal, much like the Sanders family, was to eventually end up with my own farm full of animals, gardens and room for kids to run wild. Of course I loved reading about their many family dog adventures, and related all-to-well to their chicken woes. I loved their “learning curve” as it brought about much recognition of similar and sometimes exact same experiences. I love reading Mr. Sanders thought processes, his evaluation and personal feelings on things, as well as the way he and his family went about handling both hard times and good times. It’s always interesting to me to discover how others utilize what they have to make things work. From doctoring animals to husbandry practices to fixing broken equipment, if farm life is your life, there’s nothing you can’t do. While our family’s little piece of farm-heaven is in Texas now, Tennessee will always have a place in my heart. My daughters were both born there, and my parents and brothers and their families still live there. I have gained a new nostalgic feeling from reading this book, and just love the feeling that I just got back from a trip home where I met some new friends. From Tennessee to the farm life, At Home in Dogwood Mudhole and the Sanders family also have a warm and fuzzy place in my heart. I will certainly be reading the next two volumes (I’m currently on my second trip through the first volume), and on my next visit “home” to Tennessee, I’m gonna take a trip down to Dogwood Mudhole to see it for myself. To read my Crew Mates’ reviews of At Home in Dogwood Mudhole, click the banner! Categories: TOS Crew Reviews 2013 | Tags: family life, farming, homesteading, middle tennesee | Permalink. 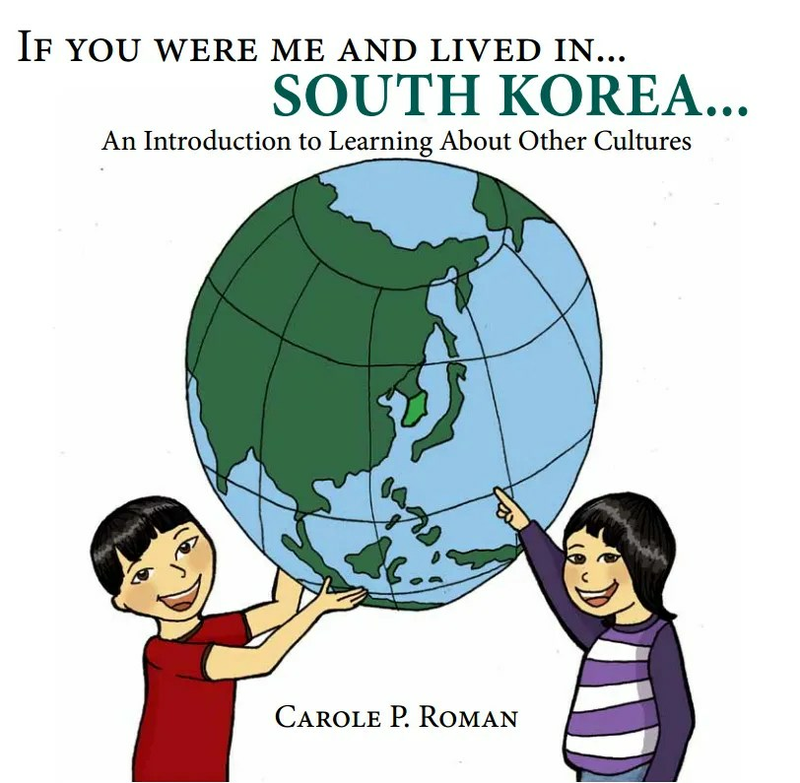 Crew Review: If You Were Me, Adventures with Cultures Around the World! 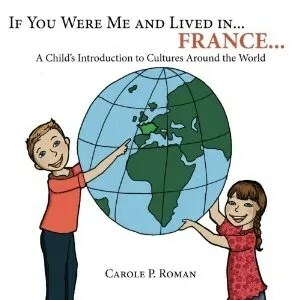 My seven-year-old Levi and I recently went on a most fabulous 4 week cultural adventure through four countries, passports in hand, made possible by award winning author Carole P. Roman with Away We Go Media. Well, we started out in Mexico as we journeyed our way through the colorful and fact-filled paperback book If You Were Me and Lived In…Mexico. While my intentions were to take one adventure per week, staying in one country for the whole week, Levi immediately had the traveling bug and jumped right back on the plane headed to Asia, enjoying If You Were Me and Lived In…South Korea without a rest. And of course my travel-bug wasn’t ready to stop there. He flashed that passport and headed straight for Europe, exploring If You Were Me and Lived In…France next. Still not ready to put the globe or passport away, he arrived in The Land of the Midnight Sun to check out the Snow Hotel in If You Were Me and Lived In…Norway. 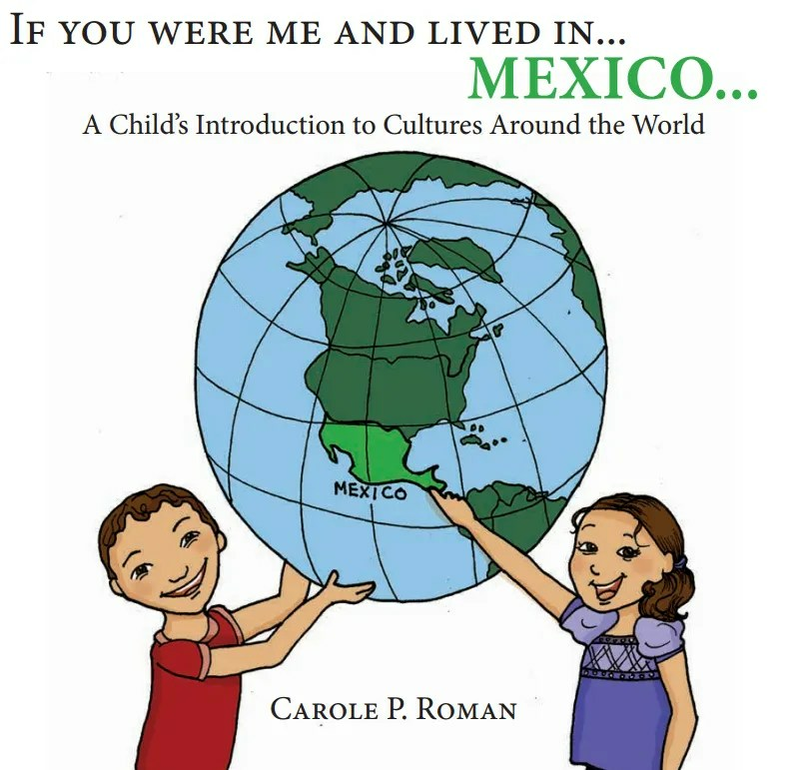 For right around $9.00 per book (for sale at Amazon and other fine bookstores) you can take your early elementary kids (targeted audience is Pre-K to age 8) on a most exciting learning adventure through other cultures. These brightly colored paperbacks are made of thick, high quality materials. The large-sized pages (8.5″ square) are richly and accurately illustrated and packed with so many fun facts of the region, culture, language, and history in large print. Each book follows the same type of format, and is between 20-30 pages. First is a picture/cutout of the country with its capital. 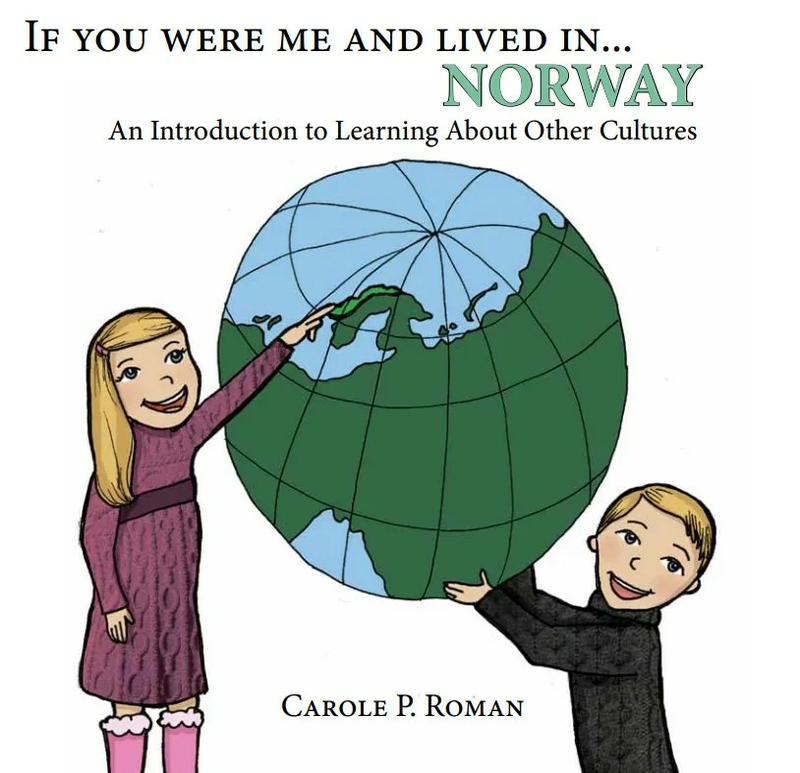 Next is a picture similar to the one on the cover with the children holding a globe and the country highlighted, with the name, description and fun fact of the country. Next is a journey to the capital city, then the child is introduced to typical boys and girls names, what you would call your Momma and Pappa, money, food, toys, historical places and events, sports, traditions, and the school. The end of the book contains a pronunciation guide for the words used from the language of the culture. The book being written in second person “you” definitely pulls the reader right into the adventure. Spoken directly to the child, the story includes thought provoking questions that lead to much discussion! As I have already spilled the beans about my lack of self control in introducing these books weekly as I had planned, I’ll just start by saying don’t buy them all at once if you want to save them to do weekly, LOL. Our awesome package came with two paper do-it-yourself passports, a blow up globe, and two colorful pencils with country flags on them. Levi and I began with a discussion of passports, world travel, and a look at the globe after blowing it up. We look at our globe all the time, but the blow up one brought a brand new interest! We found all the places we would be traveling, and tracked them with our fingers from our home in Texas. We began reading through the books, and just couldn’t stop with one on the first day of discovery. The next day we revisited the first book and spent the rest of the week on it. Mexico being the closest and most familiar to us was our first destination. He is very familiar with the language, the food (we had tamales for our cultural meal on into the week), dug out a peso, and discussed more cultural names of friends we know. We spent a day on into the week checking out the Mayan Temple with 365 steps and he imagined going to see it some day. 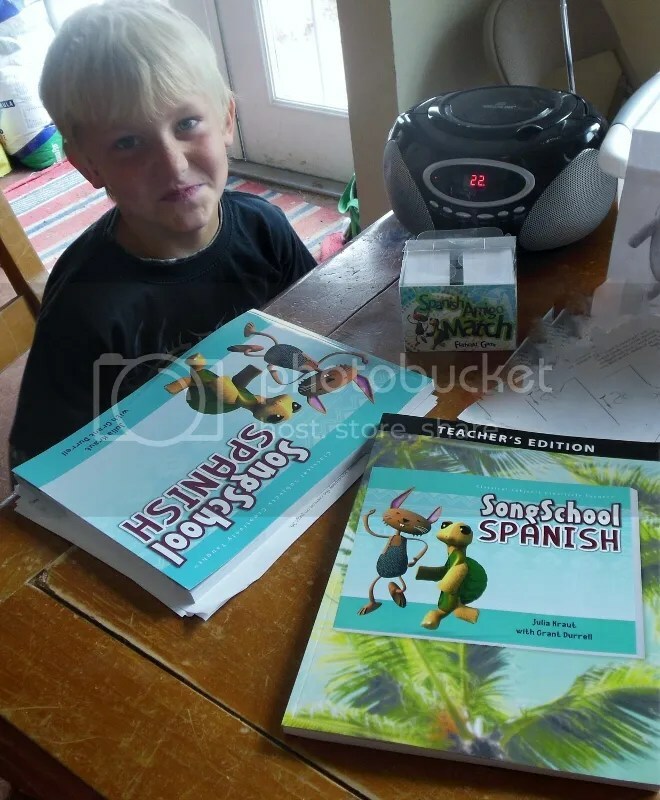 We colored a printed off flag of Mexico, and he asked to get started on his Spanish again. Next we visited South Korea. He practiced saying the names, drew his own won which is like a dollar bill, looked up Taekwondo and kicked his legs and flung his arms around the room a bit, ate rice with chopsticks (ok, we didn’t have Korean food, we went to the Chinese place, LOL), and practiced bowing. Lastly he colored a South Korean Flag. Lastly we came to what I think is both of our favorite place of all (in theory, as I am sure I would be miserable in the freezing cold after getting used to the wonderful heat of South Texas!). Norway, where the sun never sets and shines all day and night for parts of the year, was a wonderful adventure! He decided to be called Gunnar Gunn (Gunnar is one of the boy’s names in the book), and I was Mama Hellena for the week. We practiced spending our kroners for bread and making smorbrods (open faced sandwichs) out of bread and chicken to eat for our Norwegian meal. We talked about snow, skiing, dog sledding, and then made plans to visit the Kirkenes Snowhotel some day. We took quite a tour of the snow hotel online, even looked at reservations and several videos, which included the aurora borealis. Levi has read back through the books several times. His favorite seems to be Norway at this time, mostly for his obsession with skiing and the snow hotel. This adventure through the cultures has really opened his eyes to the similarities and differences between people and places throughout the whole wide world. The books are very well written, including just enough to educate and grab the attention of the reader, but not too much to be confusing or boring. These books would make and awesome gift along with some extras like paper passports, country flags, pencils, etc. 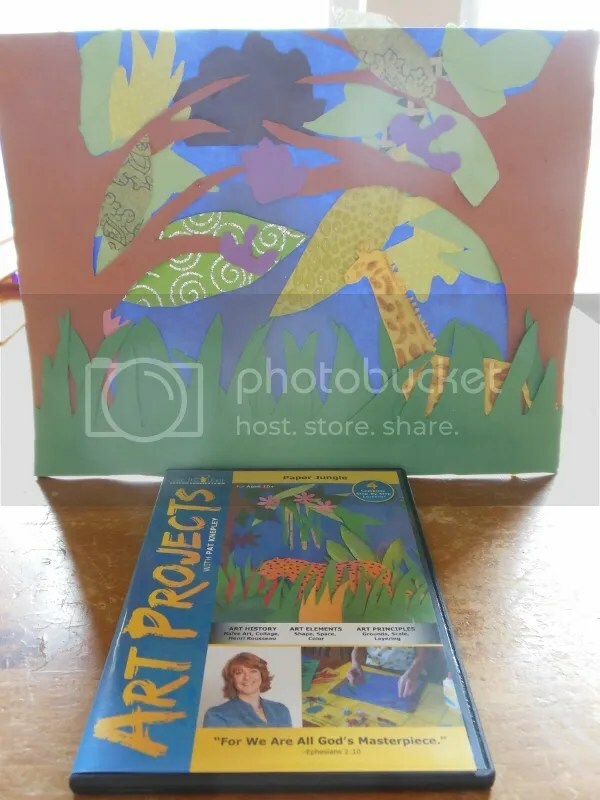 for early preschool kids, and would also be great unit studies for co-ops or study groups. We highly recommend these adventures!! To read about more Crew adventures with these books, click the banner! One of my favorite things about homeschooling is exploring the continuously expanding horizon of resources and opportunities for learning. While we’ve used online resources before, we’ve not experienced the interactive format that Bridgeway Academy offers. They have a huge variety of programs to offer, and we were blessed with reviewing Fun with Science – Marine Biology, which is one of their Learning Labs- Online Homeschool Co-ops. This 9 week interactive learning course is geared for middle schoolers ( technically listed as grades 5-8) and costs $145.00. The class meets using the Jigsaw meeting platform, where you will find diagnostic tests to make sure your computer meets all requirements, including the latest update of Java. Each week the student can log directly into the meeting site, or we were able to follow a link through the class reminder our instructor emailed us. I had some issues with our computer speed, but after two weeks of my daughter not being able to interact with the class due to our computer, our family switched internet providers (which we were planning to do for quite a while before this) and it worked like a charm. Fortunately there were power points and other resources (recordings of the classes) for those who weren’t able to attend the classes live. I will stress, however, that the live interaction is really an amazing part of this experience! Besides a fast enough internet, you will need a headset and microphone for full interaction with the class. The teacher interacts with the class on a large whiteboard, (her webcam image is on the screen as well) with power points, illustrations, and chat functions. She can ask the students questions, singling out individual answers, and the students can all chat together throughout the class as well. Along with the classroom website, the course also includes a Moodle classroom where the syllabus is located, along with assignments, special instructions, times and dates, power points, and other notes. This is where the students complete their homework assignments and turn them in. For some reason, however, my daughter couldn’t get the questions to submit from the website and just emailed her work directly to the instructor. I had to call the instructor about some issues with the setup in the beginning and she was super-helpful and very nice. She was really engaging and encouraging to the students during class time, yet was challenging and super-knowledgeable of her material. My daughter felt the level of teaching was challenging and she was really impressed with the teacher. The weekly classes last an hour and 15 minutes, and the outside assignments, though the course description says take 45 minutes to an hour, took Taylor 3-4 hours sometimes, with research and reading and putting required elements together. Of course she has been studying this subject for a few years and has many resources, and spends hours researching anyway, so that might have a bit to do with her excessive time spent on this course. Never a bad thing, in my mind, and I would certainly have to give much praise to this program for motivating my aspiring marine biologist above and beyond! Week 1: What is Marine Biology? If you log on to the Jigsaw Meeting page, you can join the class 10 minutes early, ( a feature most of us students took advantage of to use the text chat feature up until the class starts) then the class starts. Ms. Berg usually starts by showing us a power-point presentation packed with cool information and facts about the topic at hand, and also has the option to send out polls, link you-tube videos to our page, ask us questions in the text chat and let us answer vocally (if you have a headset and microphone) or write the answers, and sometimes quizzes us individually on certain things she has been teaching. She also has a whiteboard she can put pictures or diagrams on, and she can unlock it so we can draw and write on it. She mainly unlocks it so we can all have a fair opportunity to answer questions she asks. At the end of the class she will explain our homework assignment to us. Sometimes the homework assignments were questions, and some were written answers or paragraphs asking about a specific topic that was somehow related to the lecture she gave us. For example, on the marine ecosystems (coral reefs) lecture, one of the things we learned about was symbiotic relationships in marine creatures since that is a large part of coral reefs. Our homework assignment for that week was to research any type of symbiotic relationship between 2 coral reef residing creatures and write about the creatures, the habits, the type of relationship it was, and how the relationship functioned. Something about the Bridgeway Course Academy (Bridgewaytests.com, where all our homework was turned in,) didn’t agree with my internet, computer, or something, as our instructor wasn’t able to open or really even receive any of my assignments via that program. However, that wasn’t a problem as I was easily able to contact the teacher and figure something out. From then on I used my mom’s e-mail and just emailed in whatever interesting homework was due that week. There were some problems during the live class with Ms. Berg not being able to hear some of the other students giving vocal answers over the microphone, and sometimes someone wouldn’t be able to hear Ms. Berg talking on the audio part of the live class. Most of the time this could be solved by logging out and back in, but sometimes not. Also there were some minor problems with the homework on the website for the other kids. On some of the questions for the invertebrates week we went over the various different phylum of invertebrates, and we were given pictures of animals and a dichotomous key to figure out what phyla the animal belonged to. To answer the question you simply had to type the answer, but if you didn’t spell it exactly right it wouldn’t count the answer as correct, (example cnidarEa instead of cnidarIa, but I didn’t really have problem with this as I know how to spell most of these anyways and I always check my answers. I really don’t think any of this affected us that much, and we all still had fun and learned a lot! Other than that, I don’t believe there were any other problems with the program, the interface, the content or any of that. It was all very interesting to me as I have always aspired to be a marine biologist and studied the ocean. I have shelves packed with resources and paragraphs about various topics I have researched and written myself, so I think this really was a great opportunity for me to be able to take a real class taught by a real Marine Biologist, and actually learn with other students. I definitely recommend this program to anyone and everyone, though I feel it is a little too advanced for younger kids. Sure, there were some easy things but it did take a lot of strenuous time, effort, knowledge, focus, and vocabulary to be able to complete this course. Sometimes the effort and research I put forth was 3-4 hours worth to complete an assignment. It was completely worth it, I learned so much from this awesome course! I would love to check out more classes from Bridgeway in the future. I love the teacher/student interaction and it definitely helps teach my student scheduling for college prep. The cost is a bit prohibitive for us, but for those who can afford it, the program is definitely worth it! I love the variety of classes offered for all ages, and it looks like a wonderful way to get in some high school credits. To read about my Crew Mates’ adventures with Bridgeway Academy, click the banner! Categories: TOS Crew Reviews 2013 | Tags: Bridgeway Academy, marine biologist, Marine Biology | Permalink. Are you interested in providing your children with an age-appropriate resource of current events from a Biblical Worldview? Then God’s World News is just for you! You can choose one of six monthly issues, tailored to your child’s level. 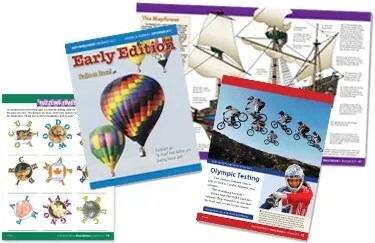 For review, we received a Full-Year Early Edition subscription, designed for children in grades 1-2. This 10-month subscription (delivered every month except May and December) is only $28.00. 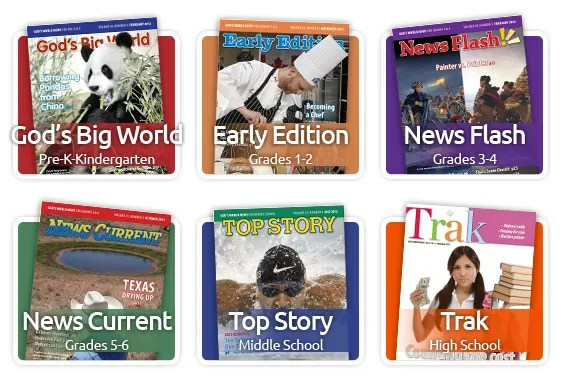 The Early Edition is full of colorful, full sized pictures with each story written in large text on a 1-2 grade level so children can read and explore the articles on their own. Most stories also have additional information for the teacher to read to the children to expand upon the information. Each issue includes games, puzzles and activities that are fun and educational to build alphabet, number, sequencing, critical thinking, writing and other skills. One of our favorite parts of the Early Edition is the Map-it activities. A 20 X 30 full sized color world map is sent along with the September issue. Within each month’s articles are small boxes with the geographical region being discussed in the article to find on the map. Within each box is a small compass rose with the corresponding number and letter from the map to make it easier to locate. We like to use small sticky flags so we can see all the places we have visited in the world! When my girls were smaller and each had their own edition of the God’s World News we had our map hanging on cork board so they could stick small pins with colorful plastic balls on the heads. They had different levels, but we loved it that they still contained the very same stories tailored to each girl’s level, so the map-it sites were the same. They enjoyed talking about the stories together and working together to find the places on the map! I would really love for you to see for yourself just how absolute cool this little magazine is. If you’ve never seen it, or even heard of it, just take a look at a sample issue of Early Edition. I know you will be as amazed as I was when I very first heard about it years ago. You can find samples of all six issues on the websites so you can see how they coordinate and differ. Also included with each subscription is access to the grade-level websitekids.wng.org full of stories, photos and downloadable activity sheets! Parents and teachers can receive weekly email newsletter which includes answer keys to the magazines quizzes and puzzles. Also with our review we received a complimentary issue of World Magazine. This is an adult news magazine with a Biblical Worldview. I had a subscription to it for a few years and absolutely LOVE the news articles from a Christian perspective. It’s nice to be able to keep up with the news without being bombarded by negativity and violence!! You can check out the online World News Magazine here! As of September 2013, with a God’s World News or World magazine subscription, subscribers will automatically be World fellow members with access for all ages of your immediate family members to World content, kids, teens, radio, video, and more! They even have apps for iPad and mobile. Check out World News Group now to read all about the benefits! As I mentioned before, we have been long-time fans of God’s World News. Years ago when I first started homeschooling I learned of GWN. When I was blessed with the opportunity to go to a homeschool convention, one of the things I really wanted to look at was GWN. I was so impressed I immediately ordered subscriptions for both of my daughters on their levels. We have subscribed to all levels except high school. We haven’t subscribed now for a few years, so when we had the opportunity to review a subscription, I was super excited to get this for Levi! Just as I suspected, he loves it every bit as much as his sisters did! It truly motivates him to read and dig in with content that is interesting and fun for him. The variety of content keeps it interesting, yet the short articles keep him engaged without wearing his reading skills out. I love the small blurbs of additional information for the parent/teacher to read and be able to expand upon and engage in discussion. So far we have explored the Aug, Sept and October issues. When we first get out the magazine he flips through the pages looking at the pictures to get a taste for the content. We usually hit the articles that capture his interest first, skipping around at his pleasure. In the October issue he was fascinated with the flying cars, and then on the opposing page a car with a parachute used for emergency access to small villages where cars cannot go. Both of these articles included “Read to Me” sections for additional information to help me discuss the information with him. Then we started back at the beginning with a “really cool” article (in his words) of a 64 year old lady who swam from Cuba to Florida. This gave him a chance to use his Map-it skills and flag cuba, following the 110 mile route to Key West with his finger. Levi loves learning about new animals that have been discovered, like Ringerl the olinguito and a new kind of hammerhead shark found in the waters off South Carolina. The colored pictures included are really awesome! I love it that every issue is packed with geography, science, biographies, history, lots of practice reading and super cool games, puzzles, find the hidden picture, crosswords, and many more mind-engaging learning activities. Lots of the articles include Bible2Life sections where the subject is discussed in a Biblical view and includes Bible verses. While I don’t need answer keys at this level, it’s nice to have access to them, as well as more content. downloadable activities, and lots of extra stuff over at the website. I can also find a summary of lessons and biographies, and the digital magazine. God’s World News is what I call a no-brainer. Kids and parents love it, and it’s just a treasure of a way to get reading practice and stay current on news, while increasing knowledge and wisdom! Awesome, ten thumbs up from Gunn Ranch academy!!! We will continue Levi’s subscription for years to come, just like we did with his sisters. And his 13 year old sister is again enjoying her very own level as well! For more family adventures with God’s World News, read my Crew Mates’ reviews over at the Crew Blog! As a homeschool Momma, I tend to over-analyze everything that comes into our home for educational and learning content from books and magazines to computer programs, movies, dvd’s, and games. I just LOVE it when we run on to a really fun game that is also educational, because what better way to really learn something than to get your hands on it and experience it for yourself? Well, that’s just what we found when we received The Presidential Game to review. This award-winning game labeled for ages 11+ is for two teams, so requires at least two players, but can be played with several on each team working together. Purchase price is $35.00. When we received our package we couldn’t wait to get started playing after pulling out the brightly colored box! Upon opening our treasure box containing the most powerful game in the world, we folded out a big 20 x 30 game board which is a big United States Map (including Hawaii and Alaska in the left corner), one bag containing blue dice and blue chips (used as votes) for the Democrat team and one bag of red dice and red chips (used as votes) for the Republican team. We also found a deck of 80 politics cards and another deck of 40 blank “write your own” politics cards, and a cool looking paper score pad tablet. We also found the most important part: the directions. 🙂 As I was reading the directions I found, near the end, a description of a really cool option to this game. Included is a code to access an interactive WebMap (which you can access from The Presidential Game website ) that allows each team to update the map to reflect the states it has won or lost in its turn. This can be used as a replacement for the nifty score pad and brings a bit of ingenuity into the picture for those techy-teens! The object of this game, is of course, to win the Presidential election by obtaining at least 270 of the 538 electoral votes. That in itself already sums up the massive amount of learning this game brings to the table! So after setting up the game board with the politics cards in place, it’ll be up to you to figure out how to solve the dilemma of who will be the Republicans and who will be the Democrats. The Republicans will use the 150 red chips as votes and use the three red dice. The Democrats use the 150 blue chips for votes and use the blue dice. The next decision which should be a little easier than the first will be to decide how many weeks it will be until the election. To give a bit of an idea on what to choose when you first start playing the game, the directions say that 30 weeks, which is 30 turns for each team, should take about an hour. After you have played the game more, you will begin to get a feel for how long it takes to play and the learning curve will be effectively completing the game in less weeks or taking more weeks to strategize more. If you choose a shorter game with less weeks, then you will end up rolling dice to gain the states that are undecided because no one has had a chance to campaign them (or to break ties, or no fundraising money has been allocated.) Of course winning a state with a “roll of the die” isn’t really the way it’s done in real life, but certainly speeds the game up :). If you are like our family, we can leave a game out and continue it for a few days, so choosing more weeks to play isn’t always a problem. Still, the lesser weeks option is also good if you are playing with younger children. To play, on each turn the team must decide whether it will go campaigning or fundraising. If the team chooses to go fundraising, they select and announce one of the four fundraising states (California, New York, Florida, and Texas) and then roll the dice. They must distribute at least half of the votes to the chosen fundraising state, but can distribute up to 100% to the chosen state. The votes not distributed to the chosen state may be allocated to any other state or states of their choosing. At the end of each fundraising turn, the team earns a Politics card. The team can choose to use the card or hang onto it to use at the end of any fundraising or campaigning turn later (unless the card is a play immediately card.) Only one card can be used per turn. These cards add, or sometimes take away, votes to specified states. The game ends when the number of weeks is up. The undecided states are rolled for, and the team with the highest number of electoral votes wins the game, and the presidency. As my girls have gotten older and have so much more on their plates, board games are not as high on their lists of things to do. My 7 year old is in that stage, however, where he just LOVES to play them, so he is our motivator. With this game, he definitely has to be on a team with an older person, though, due to his age. So we divided up into two and two and began working through the directions. We did have to play through it for a bit to get the score card under control, but it’s not real hard, just takes paying attention. The scoring is definitely one of the fore-mentioned educational aspects of the game, as it certainly helps to bring understanding of how the votes change so rapidly back and forth in a state, as well as providing a good opportunity for some quick mental math! A more thorough understanding of which states are the “important ones” to win was also gained and the process of how many votes each states gets, why some get more, why some have so very few, etc. was figured out hands-on. Anytime I can use a hands-on approach vs. trying to put something into words, well, I’m all for that! Hands-on just works. The politics cards are definitely one of our favorite things about this game. They are case scenarios/ situations/ statistics, etc. that add votes to states. These definitely led to much discussion on how media, personal lives, negative campaigning, world events, etc. play a HUGE role in campaigning and being in the public eye in general. We really had some laughs as well as far-reaching discussions on a huge variety of subjects from presidential personal lives, kids, spouses and families, to messing up facts in a debate, to foreign affairs, to the many faces of our media. This isn’t the first time we have discussed these types of things amongst our family, so we revisited and expanded on some discussions, but there were many, many new ideas popping up as well. 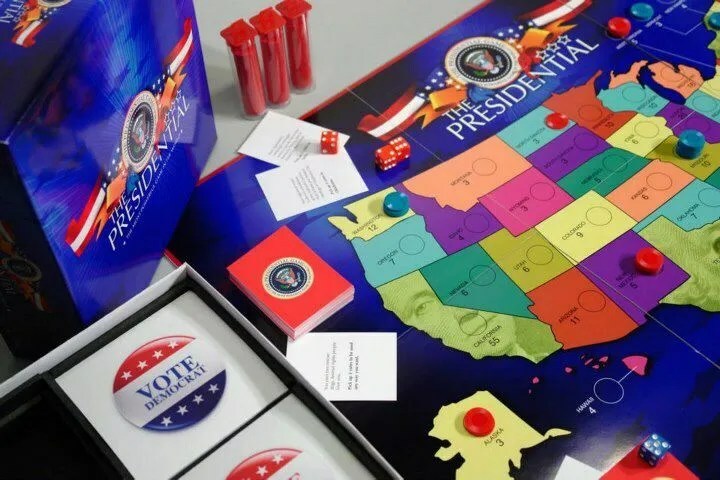 The bottom line of this game is that your kids will know and UNDERSTAND the electoral voting process in the presidential election after playing this game. They will get an excellent mental picture of our United States geography as they travel through the states campaigning and fundraising. They will get a *civilized* taste for the big frontier of politics, media, and how that all works together (or sometimes against each other) to put a president into office in the United States of America. And after playing this game, they can teach it back to you. We haven’t been able to coordinate playing the game near a computer yet, so haven’t used the WebMap calculator to keep up with the votes during game play. We are planning to get a laptop soon (as well as getting a new internet provider!) which will certainly make the WebMap a fun addition to our game play. It would be an amazing tool to use in a co-op or teen government-study project, and will certainly be played a lot during the next election year! 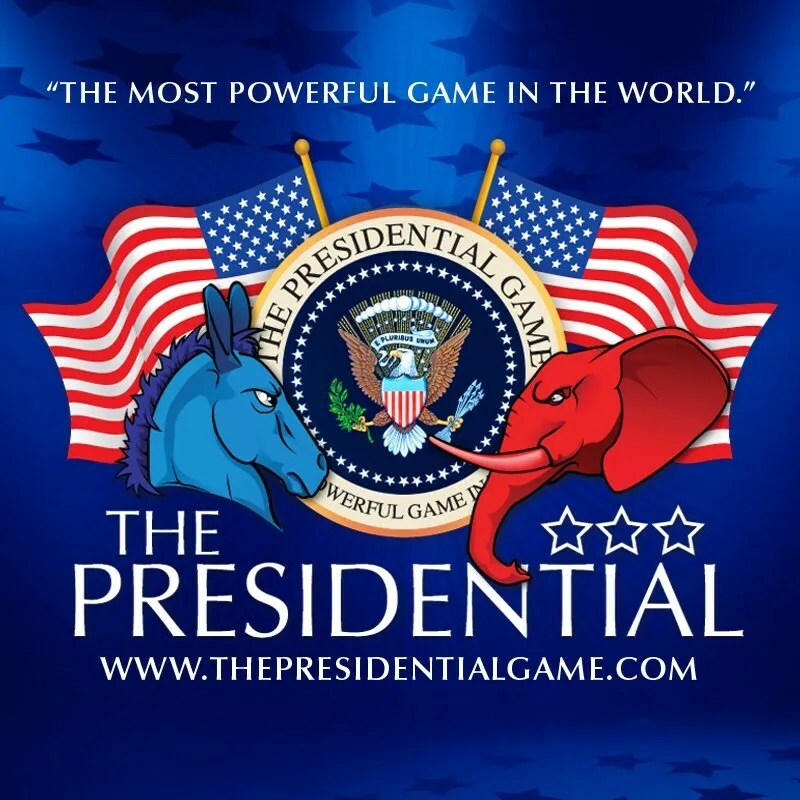 To read about my Crew Mates’ adventures with The Presidential Game, click the banner!